A rich and creamy Russian Easter pudding that is pure indulgence! Spring is the time of renewal, of new beginnings. And this finds it’s way into our kitchens and our stomachs in the form of purple sprouting broccoli, spring greens and new seasons lamb. But when it comes to the sweet stuff Easter looms large and things can seem to be dominated by chocolate. It is the festival of chicks, eggs, and bunny rabbits, all rendered in chocolate. I am not above wanting to devour my fair share of these cute confections. When I was a child the family of friends I held in greatest awe was the one whose Easter breakfast table was invisible, hidden beneath their bodyweight in a chocolate menagerie. But having immersed myself more than fully in the stuff of late, virtually bathing in it for my chocolate feature (see page …. ), I thought I would go a different route. There is also a rich tradition of baking at Easter, from hot cross buns to Simnel cake. In my family Easter means Paskha, the Russian Easter pudding that we always ate. My Russian grandfather loved it, and insisted we had it yearly. No hardship, I loved it too! 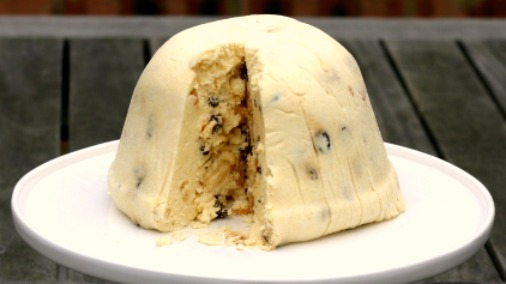 It is akin to an unbaked cheesecake, but contains the dried fruits and raisins more commonly found in a baked one. Also unusual is that it has no crust, and is formed, not in a cake tin, but in a muslin-lined mould, many days in advance of eating. This allows liquid to drain off, leaving a dense, rich and exceptionally creamy pudding. I remember my mother turning the Paskha out of its mould to finally bring it to the table, having watched it silently preparing itself magically in the fridge during the build up to our Easter lunch. It is wildly rich, so a little goes a long way. But it is always eaten alongside a lighter, bread-like cake called Kulich, which cuts its intensity perfectly. I have had a go at making Kulich, a yeast-risen bread that is very similar to Panettone. But it is so similar to Panettone, and that is so widely available now, that it is fine to just buy a good one of those. Paskha shares with Panettone that glorious quality of being infused with the lemony sweetness of the candied citrus they both contain. When the muslin is peeled off, and that smell reaches my nostrils, it is evocative in the way that only scents can be: of every Easter of my childhood and of my grandfather who adored it. There are many different versions of this recipe, as is usually the case with home classics. This is the one my grandmother makes every year. She got it from an expat Russian cookbook of the 1940s she had in the USA. Of course produce at that period in America will have been different from that in Russia. Cottage cheese was available, so that will have affected what was used. It is totally heart attack inducing, but is only a once a year treat. My beloved grandfather died at the age of 96 and my grandmother is 99 and counting, so it can’t be too bad! Cream the butter until very fluffy. Beat the egg yolks until they are thick and lemon coloured. Stir the sugar into the egg yolks gradually and beat well. Blend the yolks and sugar with the creamed butter. Push the cottage cheese through a sieve to make it smooth, then add it to the butter and egg mixture and blend thoroughly. Fold in the whipped cream, vanilla, raisins and peel. Next line a good-sized mould with a damp cloth or muslin, so that there is plenty of cloth left hanging over the sides. The mould needs to have a hole in the bottom for drainage. I use a 7” flowerpot, which I have thoroughly cleaned beforehand. Put all the mixture down into the muslin, and then wrap the excess muslin over to cover the top thoroughly. Weight the top of the Paskha by placing some tins or weights on a saucer on top of the folded over muslin. Next set this in the fridge, with something underneath it to catch the liquid that will drain from the bottom of the pot. I put it on a wire rack set in an oven tray. If you have a fridge with wire shelves you could put it straight onto an upper shelf, with something on the shelf below to catch the drips. Leave the whole thing in the fridge for up to five days, but certainly for at least two. When you are ready to serve take it out of the pot, open the top of the muslin and up end it on to your serving plate. Then peel off the muslin to reveal your dome of joy! Top Tip: Paskha contains raw eggs, so caution should be taken when serving to those who might be vulnerable. 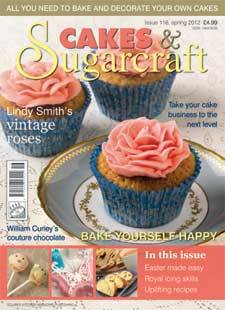 This article first appeared in Cakes & Sugarcraft Magazine issue 116.